Kevin Harvick will attempt to become the first driver to win four Monster Energy NASCAR Cup Series races in a row since Jimmie Johnson did it in 2007. The driver of the No. 4 Busch Beer Ford Fusion for Stewart-Haas Racing (SHR), heads to Sunday’s Auto Club 400 at Auto Club Speedway in Fontana, California, for the final race of the three-race “NASCAR Goes West” swing looking for a sweep. In fact, Harvick has upped the ante by already winning at Atlanta Motor Speedway one race before the swing. The last three weeks, Harvick has visited victory lane at Atlanta, Las Vegas Motor Speedway and ISM Raceway near Phoenix. He also has an Xfinity Series win at Atlanta, which makes it four wins in the last four races he’s entered. To add a fourth consecutive Cup Series win would put him in elite company. In the modern era, only eight drivers have won four consecutive Cup Series races – Cale Yarborough in 1976, Darrell Waltrip in 1981, Dale Earnhardt in 1987, Harry Gant in 1991, Bill Elliott in 1992, Mark Martin in 1993, Jeff Gordon in 1998 and Johnson in 2007. What could make a fourth Cup Series win in a row even more meaningful for Harvick is the location. Auto Club Speedway serves as a home game for the 2014 NASCAR Cup Series champion, who grew up approximately 150 miles northwest of the track in Bakersfield, California. The stop at Fontana should provide confidence for the Bakersfield native. He is one of three drivers from California to win a Cup Series race at there, joining Jeff Gordon and Jimmie Johnson. Harvick scored his only Cup Series win in Fontana on March 11, 2011. Kyle Busch dominated that afternoon, leading 151 laps of the 200-lap event but, in the closing laps as Busch attempted to hold off a hard-charging Johnson, Harvick worked the top of the racetrack and ran down the leaders. On the final turn of the final lap, Harvick passed Johnson and beat him to the finish line by .144 of a second. He led only one lap on the day, but it secured the victory at his home track. Harvick has come close in recent history to adding a second victory to his resume at Fontana, finishing second in both 2015 and 2016. In 2015, he led 34 laps but finished second by .710 of a second to Brad Keselowski after a late-race restart. He led 143 of 200 laps in 2016 but finished second to Johnson by .772 of a second in an overtime finish. But, it’s more than winning on the Fontana track that makes Harvick a hometown favorite. He always does what he can to give back to his hometown. Harvick is visiting Kern County Raceway in Bakersfield this week to race in the NASCAR K&N Pro Series West opener Thursday night. He will be driving the No. 4 FIELDS, Inc. Ford for Jefferson-Pitts Racing as a way to help promote the series and its drivers. In March 2016, he and baseball legend Cal Ripken Jr. cut the ribbon to unveil the Kevin Harvick Foundation Park at the Boys & Girls Club in Bakersfield, which provides a clean and safe environment in which local youth can play, learn and grow. The state-of-the-art facility in Bakersfield is designed for multisport use, featuring four outdoor fitness stations, a rubber track surface circling the field’s perimeter, and a digital scoreboard. The park, a gift to The Salvation Army Boys & Girls Club of Kern County, is maintained by the organization, with which the Cal Ripken Sr. Foundation and Kevin Harvick Foundation collaborate to create and implement character education programming and clinics for the children who utilize the facility. The Boys & Girls Club of Kern County is not the only project Harvick has completed in his hometown to help area youth. After he won the 2014 NASCAR Cup Series championship, he planned an additional stop as part of his champion’s tour – a visit to Bakersfield. Harvick wanted to bring the Cup Series trophy to his high school, where he spoke to more than 2,000 kids in the gymnasium and encouraged them to follow their dreams. In fact, Harvick regularly gives back to his hometown through donations from his foundation. Donations have included funds to provide wrestling, baseball and golf equipment to his high school in order to ensure that anyone who wants to participate can do so without worrying about paying for proper equipment. 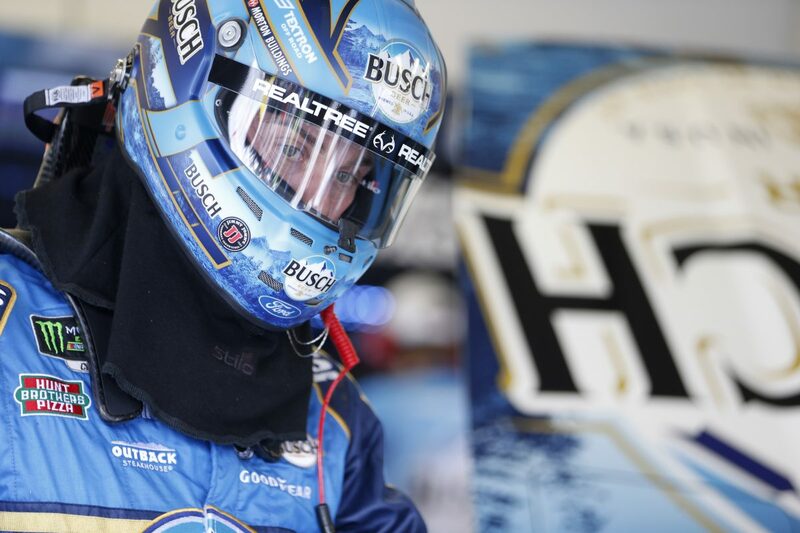 Harvick hopes he can give his hometown fans another thing to cheer about at the track Sunday as he attempts to capture his fourth consecutive Cup Series win. What makes racing at Auto Club Speedway so challenging? Is Auto Club Speedway a place you look forward to going to, and why?